What to look for and what to watch out for. What is a Sleep Shop? It’s more than “just” a mattress store. While we do carry the best selection of mattresses in Bellingham and Whatcom County at great prices, we also focus on other aspects of healthy sleep… such as specialty pillows, luxury linens and natural bedding products. Customers have been very impressed with our mattress options and we frequently hear… “You have the nicest bedding store in the Northwest” and “Great prices.” Please view our Honesty & Integrity statement. Drawing on our many years of mattress experience we’ve compiled a line-up that is second to none – offering several comfort choices at each price point – something to fit every budget. A lot of mattress stores overlook the importance of fine linens in creating a restful sleep environment. Our linens are of excellent quality and beautiful. From soft natural sheets to smooth and silky bamboos, come feel the difference. Scott’s bedding experience began in January of 1985 when he began working at the old DeWitt’s Mattress Warehouse in the Fountain District of Bellingham. Within a couple of years he was the Sales Manager – then the Store Manager, and eventually a co-owner of the business. It was during this period that he made some very important contacts in the bedding industry. After stepping away from the business for a couple of years, Scott took over a struggling local mattress department and built its business exponentially. But it was just a mattress department and didn’t address any other aspects of better sleep. It was at this point that Scott and his wife LeAnn decided to open Northwest Sleep Solutions in Fairhaven. 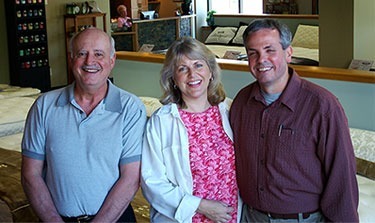 Here you will find 50 years of combined experience in the mattress industry – offering great products, knowledgeable staff and better sleep. ©2017 Northwest Sleep Solutions | Bellingham Mattress Store | All rights reserved.